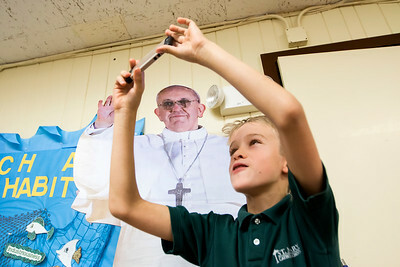 Sarah Nader- snader@shawmedia.com William Gillaspie, 10, of Woodstock takes a selfie with a life-size cardboard image of Pope Francis during lunch at Saint Mary Catholic School in Woodstock Tuesday, September 15, 2015. The cardboard image is traveling around the school throughout the month of September to promote the World Meeting of Families and the Papal visit. 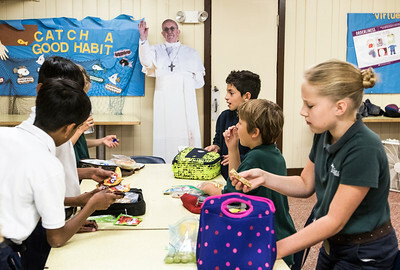 Sarah Nader- snader@shawmedia.com A life-size cardboard image of Pope Francis over looks children during lunch at Saint Mary Catholic School in Woodstock Tuesday, September 15, 2015. The cardboard image is traveling around the school throughout the month of September to promote the World Meeting of Families and the Papal visit.